The ROAM JL Steering Geometry Kit is designed to correct the steering geometry and solve bump steer issues on lifted Jeep Wrangler JL’s. The ROAM JL Steering Geometry Kit raises both the JL drag link and track bar pivot ~3″ at the axle to correct the roll center and steering angles on a Jeep Wrangler JL with more than 3″ of lift. Forged rod ends, oversized chromoly DOM tubing, and laser cut mixed 3/16″ and 1/4″ high strength steel brackets improves strength and steering feel. To complement the new steering geometry provided by the flipped drag link, a front track bar and trackbar bracket is supplied as part of the ROAM JL Steering Geometry Kit. The flipped drag link flattens out the steering angles on lift heights of 3” and above providing better steering performance along with a more solid steering feel over the factory setup. The new front trackbar bracket mounts to the factory track bar mount on the axle. Not only does the ROAM JL Front Trackbar Relocation Kit adapt the OE/factory mount for corrected track bar height and track bar angle, but also strengthens the OE JL track bar mount by tying into the axle via a design that spreads the torsional forces and load though three more bolt locations. This installation requires drilling out the steering arm tapered hole in the passenger’s side knuckle and installing a precision machined tapered insert. The new insert has a slight interference fit eliminating any possibility of play or loosening and can also be reused in the opposite position if the vehicle needs to be returned to stock. No cutting or welding is required for installation. The ROAM JL Steering Geometry Kit includes the ROAM JL Flipped Drag Link Kit, the ROAM High Clearance JL Adjustable Front Track Bar, and the ROAM JL Track Bar Relocation Kit. Powdercoated with a 2 stage textured poly powdercoat for durability. Exceeds all OE specifications for resistance to the elements. Made with pride in the U. S. of A. 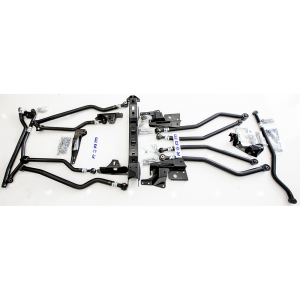 – The ROAM JL Steering Geometry Kit includes the ROAM JL Flipped Drag Link Kit, the ROAM High Clearance JL Adjustable Front Track Bar, and the ROAM JL Track Bar Relocation Kit. – Includes an axle side track-bar bracket (relocates track bar pivot) to keep the steering geometry correct. Constructed of DOM chromoly tubing and a forged drag link end to further reduce any front end shimmy or excess movement. – No bump stop extensions needed – What sets our design, build process, and quality apart isn’t just how strong our drag links, track bars, and high strength steel brackets are, but rather how they’re designed and built. 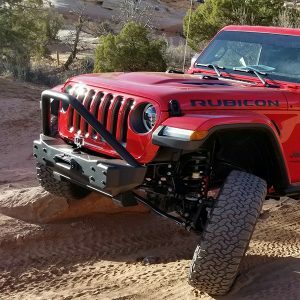 Our high clearance flipped drag link and track bar will clear the frame rails under full articulation and suspension movement even when installed on a stock height JL. Will not reduce available suspension travel unlike other track bars that do not account for frame rail clearance. – Double adjuster sleeve and pinch bolt setup allows adjustment of drag link length while the drag link is installed in the vehicle. The forged drag link will thread into the factory adjustment sleeve. – No cutting or welding required for installation. Drilling of the passenger side steering knuckle with a 7/8” drill bit is required to complete the install. 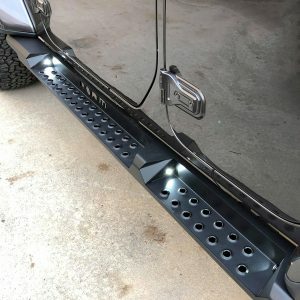 FREE JL Steering Knuckle Drill Jig! Perfect taper alignment every single time.